Epstein–Barr virus (EBV) (human herpesvirus 4) is a ubiquitous virus that latently infects over 90% of the world population and was first identified by Epstein et al. in Burkitt Lymphoma, making it the first isolated human viral carcinogen., The relationship between EBV and nasopharyngeal carcinoma (NPC) was first suggested in 1966 by Old et al. based on the presence of high titers of EBV antibodies in diseased patients, but the initial in situ demonstration of EBV DNA in biopsies of NPC was by Zur Hausen et al. in 1970. Since then, EBV has been consistently detected in NPC, particularly nonkeratinizing carcinoma (NKC), and the virus is detected in virtually every primary and metastatic tumor, irrespective of the degree of tumor differentiation or the geographic location.,, EBV has been shown to have a stronger association with NKC than with keratinizing squamous cell carcinoma (KSCC); consequently, it is almost always positive in high-risk populations where NKC predominates and positive in only a proportion of cases in low incidence areas where KSCC predominates. EBV DNA within the tumor cells are monoclonal, suggesting that NPC occurs from the clonal proliferation of a single EBV-infected cell, and the consistent expression of the same EBV latency program in precursor lesions further support this. The EBV infection in NPC exhibits Type II latency pattern with the expression of EBV nuclear antigen-1 (EBNA-1), latent membrane proteins (LMPs-1, 2A and 2B), EBV-encoded early RNAs (EBERs), and micro-RNAs. All three of the LMPs are detected in NPC and are highly multifunctional. LMP-1 exerts an antiapoptotic function by upregulating Bcl-2 and altering the ratio of initiator caspase-8 and its inhibitors. It also constitutively activates signaling systems (nuclear factor- kappa B, JNK-kinase, and Janus kinase/signal transducers and activators of transcription-pathways), upregulates intercellular cell adhesion molecule-1, lymphocyte function antigen, and MHC Class I and II molecules, induces expression of epidermal growth factor receptor, and induces telomerase activity., By and large, the LMP-1 has a significant effect on cellular gene expression and cellular growth which is consequential in the highly invasive malignant nature of NPCs. A study by Hu et al. supports this and shows that LMP-1-positive NPC grows more rapidly and extensively than LMP-1-negative tumors. However, only about two-thirds of NPCs express LMP-1. EBV can be demonstrated in NPC by the detection of its viral products. The detection of EBER transcripts by in situ hybridization (ISH) is the popular and most reliable method for the molecular diagnosis of EBV in NPC and considered the gold standard. LMP-1 immunochemistry is not as effective as EBER-ISH in detecting EBV in NPC as LMP-1 is often not detectable even in obviously EBER-positive cells., Yet, LMP-1 immunohistochemical staining is a rapid, cheaper, and effective method of EBV detection, thus, retains a role in the clinical evaluation, especially in resource-poor locations. Other useful methods of detecting EBV include viral nucleic acid amplification, that is, polymerase chain reaction and nucleic acid sequence-based amplification, serology (ELISA and immunofluorescent assays), Southern blot analysis of EBV DNA, gene expression profiling, culture of EBV or EBV-infected lymphocytes, and electron microscopy to examine the detailed morphologic changes associated with EBV infection. Significantly elevated IgG and IgA antibody titers against multiple viral antigens are consistently observed in NPC; these include antibodies against EBV viral capsid antigen, EBNA-1, EBNA-2, lytic antigens, and neutralizing antibodies against EBV-specific DNAse. These antibody titers are observed to precede tumor development by several years and are elevated in advanced disease correlating significantly with tumor burden, remission, recurrence, and survival. Hence, EBV-specific serology is now employed in screening for the early detection of NPC as well as for differential diagnosis in fine-needle aspiration biopsies of metastatic cervical nodes and for monitoring of response to therapy., However, false-positive results of 9%–30% may pose a limitation for its use. This study was conducted to determine the EBV LMP-1 expression of NPC seen over 22 years, from 1992 to 2013 in Ahmadu Bello University Teaching Hospital (ABUTH). This was a 22-year retrospective study of all NPCs diagnosed at the Department of Pathology, ABUTH from January 1, 1992 to December 31, 2013. The paraffin-embedded tissue blocks (PETB) of all histologically diagnosed NPCs within the study period were retrieved and examined. Cases in which the tissue blocks were missing, badly damaged, or had insufficient tissue were excluded from the study. 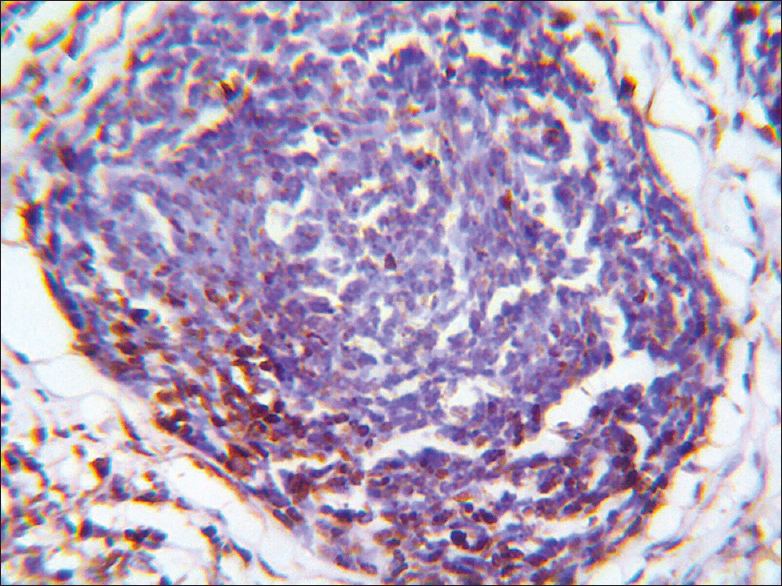 The histopathological patterns were analyzed using the hematoxylin and eosin-stained slides, and the histopathological diagnosis was in accordance to the 2005 World Health Organization classification. Indirect IHC for EBV LMP-1 was done on each sample to determine the expression of EBV in the tumor cells. Sections were made at 2–3 μ from the PETB and placed on negatively-charged slides. The sections were then deparaffinized in xylene, rehydrated in decreasing concentrations of alcohol, and then sequentially incubated with hydrogen peroxide block, protein block, anti-EBV LMP-1 antibody, complement, horseradish peroxidase conjugate, and diaminobenzidine chromogen/substrate mixture for about 10 min each and rinsed each time in a buffer. The slides were counterstained with hematoxylin, then dehydrated and coverslips applied. All steps were performed at room temperature. Both negative and positive controls were run alongside the tests. The slides were viewed under the light microscope and brown granular cytoplasmic and membrane staining were interpreted as positive for EBV LMP-1, while bluish staining of the cytoplasm and membrane was interpreted as negative for EBV LMP-1. Furthermore, nuclear and paranuclear brown dot staining were interpreted as false positive. The data obtained were statistically analyzed using SPSS version 24 (IBM SPSS statistics for Windows, version 24). 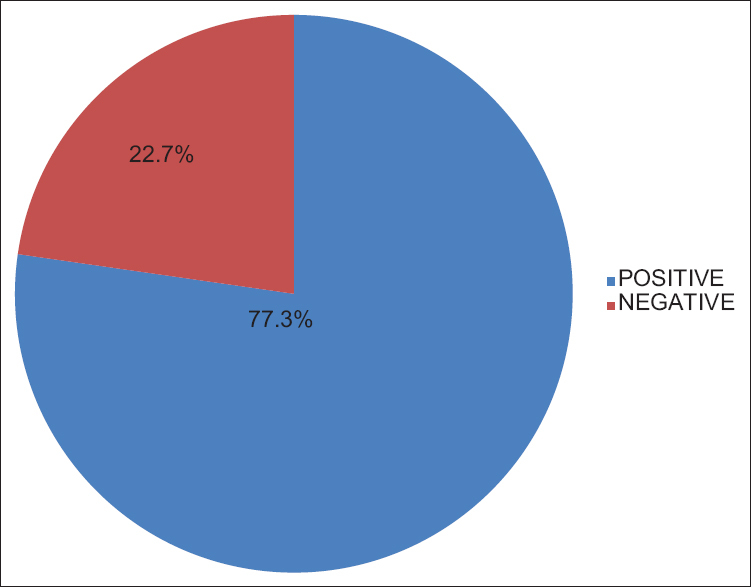 A total of 112 NPC cases were histologically diagnosed, 66 (58.9%) met the inclusion criteria of this study and 46 (41.1%) were excluded. There were 46 male (69.7%) and 20 female (30.3%) with a male-to-female ratio of 2.3:1. The ages ranged from 6 to 91 years with an overall mean age of 42.8 years and modal age of 40 years. The age group with the highest incidence is 40–49 years age group with 18 cases (27.27%) [Table 1]. Overall, 51 (77.3%) samples were positive for EBV LMP-I IHC, while 15 (22.7%) were negative [Figure 1]. A total of 63 (95.5%) of the tested samples were NKC, of which 49 (77.8%) were EBV positive and 14 (22.2%) were negative. 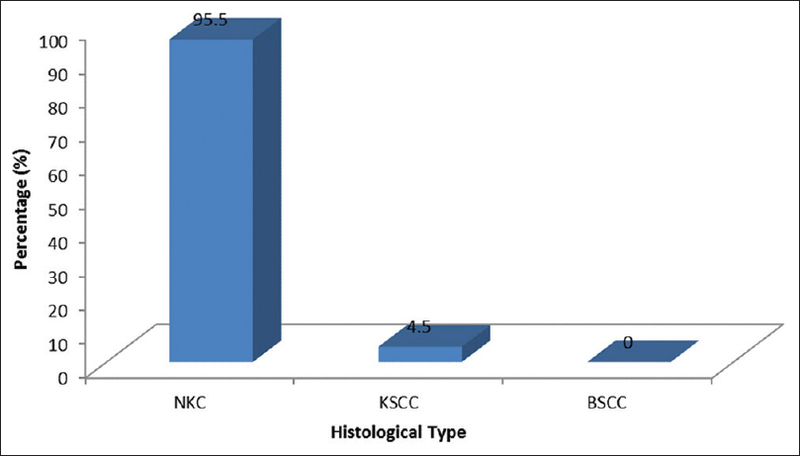 KSCC constituted 3 (4.5%) cases, 2 of which were EBV positive (66.7%) and 1 was negative (33.3%) [Figure 2] and [Figure 3]. Fisher's exact test statistic value is 0.545, which is not significant at P < 0.05. No basaloid squamous cell carcinoma case was available for the study. 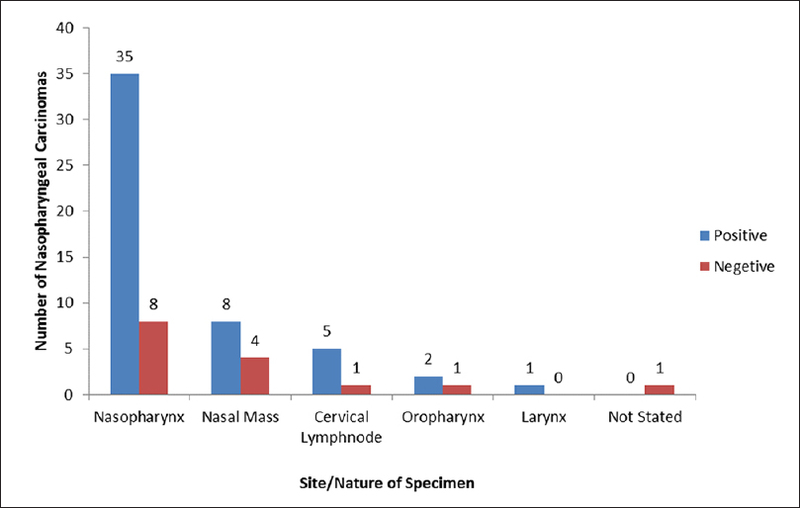 The nasopharynx was the most common site of surgical biopsy with 43 cases (65.2%), whereas laryngeal masses were the least common with a single specimen (1.5%). Specimens from the nasopharynx and cervical lymph node show 81.4% and 83.3% EBV positivity, respectively, while those from the nasal cavity and oropharynx show 66.7% positivity each. The single laryngeal biopsy was EBV positive [Figure 4]. [Figure 5], [Figure 6], [Figure 7] show representative photomicrographs of the EBV LMP-I IHC. NKC showed 77.8% EBV LMP-1 positivity which is similar to observations by Pathmanathan et al. who detected 73% positivity. Although several studies have shown that NKC is invariably EBV-positive, irrespective of geographical origin,,,,,, these studies were done using various methods of EBV detection and may therefore not be the best comparison. KSCC showed 66.7% EBV LMP-1 positivity. Existing literature have presented conflicting data concerning the association of EBV with KSCC: some studies have been unable to demonstrate the presence of EBV in KSCC ,, while others have.,, This variation may be attributed to technical factors and geographical variations. With regard to the conflicting reports of EBV association with the histopathological types of NPC, Pathmanathan et al. have convincingly argued that the existence of mixed histological types, the phenomenon of dedifferentiation seen in the clinical course and biological evolution of NPC strongly suggest that all types of NPC are variants of an EBV-associated malignancy. Although most specimens in this study were from the nasopharynx, presumably suggesting that they may be limited to the nasopharynx, the rest of the specimens are outside the nasopharynx, thus, suggesting advanced disease. Some of these head-and-neck mucosal sites occasionally develop primary lymphoepithelial carcinomas; however, in contrast to NPC, they do not show a strong association with EBV except in Asians. The strong association with EBV seen in this study is therefore highly suggestive of NPC rather than primary lymphoepithelial carcinomas. There is a high prevalence of EBV LMP-1 in NPC. 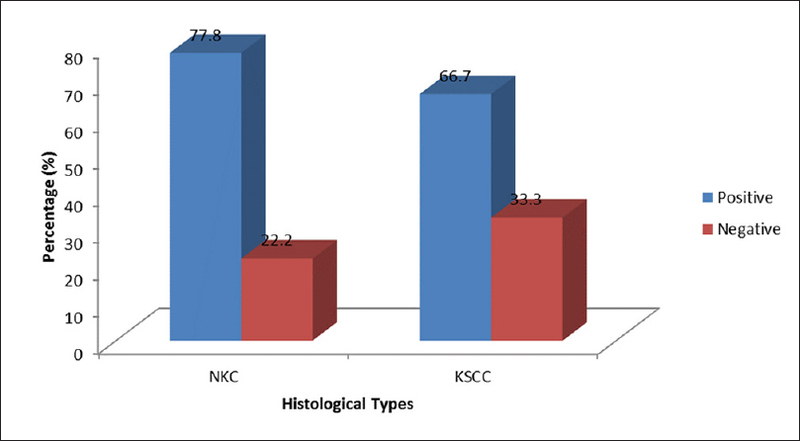 However, there is no statistical difference in the prevalence of EBV in NKC and KSCC. NPC has shown an association with EBV irrespective of histological type. LMP-1 IHC has proved useful in detecting EBV in NPC in this study. The findings in this study show several similarities and some peculiarities in comparison with those of other studies done in different parts of the country, Africa and globally. The superiority of EBER ISH over EBV LMP-1 IHC has been documented, however, more local studies are recommended to compare the sensitivity of various methods of EBV detection so as to choose the most appropriate method for our environment, one which is both sensitive and affordable. IARC Monographs. A Review of Human Carcinogens. Vol. 100B: Biological Agents. WHO International Agency for Research on Cancer. Report No 10171606:49-80; 2012. Old LJ, Boyse EA, Oettgen HF, Harven ED, Geering G, Williamson B, et al. 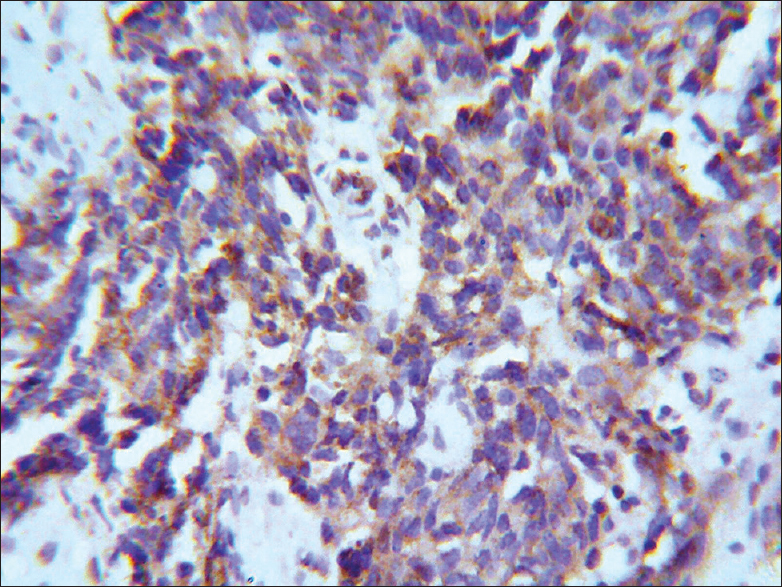 Precipitating antibody in human serum to an antigen present in cultured Burkitt's lymphoma cells. Proc Natl Acad Sci U S A 1966;56:1699-704. Zur Hausen H, Schulte-Holthausen H, Klein G, Henle W, Henle G, Clifford P, et al. EBV DNA in biopsies of Burkitt tumours and anaplastic carcinomas of the nasopharynx. Nature 1970;228:1056-8. Barnes L. World Health Organization, International Agency for Research on Cancer Pathology and Genetics of Head and Neck Tumours: IARC Press 2005;17:81-97. Gullo C, Low WK, Teoh G. Association of Epstein-Barr virus with nasopharyngeal carcinoma and current status of development of cancer-derived cell lines. Ann Acad Med Singapore 2008;37:769-77. Bernard W Stewart PK. World Cancer Report: IARC Press Lyon 2003; 2003. Hu LF, Chen F, Zhen QF, Zhang YW, Luo Y, Zheng X, et al. Differences in the growth pattern and clinical course of EBV-LMP1 expressing and non-expressing nasopharyngeal carcinomas. Eur J Cancer 1995;31A: 658-60. Gulley ML. Molecular diagnosis of Epstein-Barr virus-related diseases. J Mol Diagn 2001;3:1-10. Ocheni S, Olusina DB, Oyekunle AA, Ibegbulam OG, Kralger N, Bacher U, et al. EBV-associated malignancies. Open Infect Dis J 2010;4:101-12. Chien YC, Chen JY, Liu MY, Yang HI, Hsu MM, Chen CJ, et al. Serologic markers of Epstein-Barr virus infection and nasopharyngeal carcinoma in Taiwanese men. N Engl J Med 2001;345:1877-82. Adegboyega PA. Viruses and cancer. Afr J Clin Exp Microbiol 2012;13:1-27. Lee WY, Hsiao JR, Jin YT, Tsai ST. Epstein-Barr virus detection in neck metastases by in-situ hybridization in fine-needle aspiration cytologic studies: An aid for differentiating the primary site. J Sci Spec Head Neck 2000;22:336-40. Juan R. Nasal cavity, paranasal sinuses and nasopharynx. In: Juan R, editor. Rosai and Ackerman's Surgical Pathology. 10th ed., Vol. 1. St. Louis, Missourri: Mosby-Year Book. Inc.; 2010. p. 291-9. Chang ET, Adami HO. The enigmatic epidemiology of nasopharyngeal carcinoma. Cancer Epidemiol Biomarkers Prev 2006;15:1765-77. Vera-Sempere FJ, Burgos JS, Botella MS, Cordoba J, Gobernado M. Immunohistochemical expression of Epstein-Barr virus-encoded latent membrane protein (LMP-1) in paraffin sections of EBV-associated nasopharyngeal carcinoma in Spanish patients. Eur J Cancer B Oral Oncol 1996;32B:163-8. Tabyaoui I, Serhier Z, Sahraoui S, Sayd S, Cadi R, Bennani OM, et al. Immunohistochemical expression of latent membrane protein 1 (LMP1) and p53 in nasopharyngeal carcinoma: Moroccan experience. Afr Health Sci 2013;13:710-7. Niedobitek G, Young LS, Sam CK, Brooks L, Prasad U, Rickinson AB, et al. Expression of Epstein-Barr virus genes and of lymphocyte activation molecules in undifferentiated nasopharyngeal carcinomas. Am J Pathol 1992;140:879-87. Niller HH, Wolf H, Minarovits J. Epigenetic dysregulation of the host cell genome in Epstein-Barr virus-associated neoplasia. Semin Cancer Biol 2009;19:158-64. Nakao K, Yuge T, Mochiki M, Nibu K, Sugasawa M. Detection of Epstein-Barr virus in metastatic lymph nodes of patients with nasopharyngeal carcinoma and a primary unknown carcinoma. Arch Otolaryngol Head Neck Surg 2003;129:338-40. Pathmanathan R, Prasad U, Chandrika G, Sadler R, Flynn K, Raab-Traub N, et al. Undifferentiated, nonkeratinizing, and squamous cell carcinoma of the nasopharynx. Variants of Epstein-Barr virus-infected neoplasia. Am J Pathol 1995;146:1355-67. Niedobitek G, Hansmann ML, Herbst H, Young LS, Dienemann D, Hartmann CA, et al. Epstein-Barr virus and carcinomas: Undifferentiated carcinomas but not squamous cell carcinomas of the nasopharynx are regularly associated with the virus. J Pathol 1991;165:17-24. Breda E, Catarino RJ, Azevedo I, Lobão M, Monteiro E, Medeiros R, et al. Epstein-Barr virus detection in nasopharyngeal carcinoma: Implications in a low-risk area. Braz J Otorhinolaryngol 2010;76:310-5. Busson P, Keryer C, Ooka T, Corbex M. EBV-associated nasopharyngeal carcinomas: From epidemiology to virus-targeting strategies. Trends Microbiol 2004;12:356-60. Dolcetti R, Menezes J. Epstein-Barr virus and undifferentiated nasopharyngeal carcinoma: New immunobiological and molecular insights on a long-standing etiopathogenic association. Adv Cancer Res 2003;87:127-57.